WebClient users can see security information such as last login time, last login IP address, etc. If the Administrator has defined mailbox size limits, users can see their disk quota information (the amount of disk space that their data occupies and how much free space they have left). 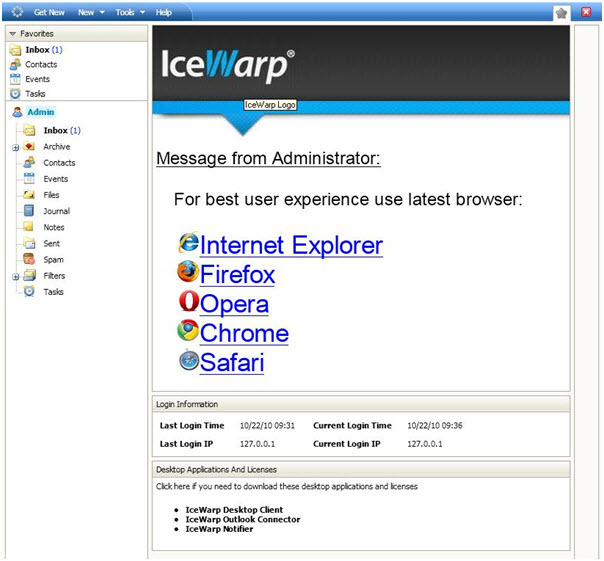 Users also have access to links to additional client software (Desktop Client, Outlook Connector, Notifier). 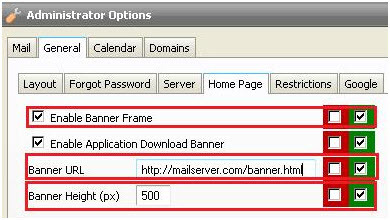 Finally, the Administrator can add any html page in the frame with additional information, such as server maintenance shut-down schedule. 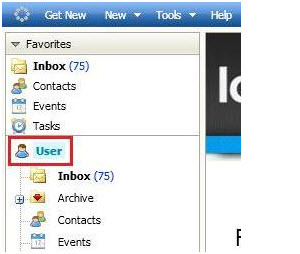 The Home Page is displayed if user clicks on the main root icon, which is usually identified by the user’s name. 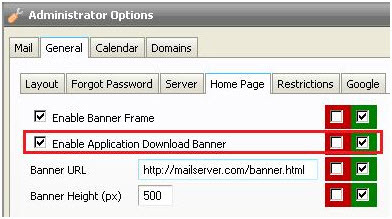 Administrators may implement mailbox size limits for their users. A user’s actual mailbox size may be displayed in the box labeled “Disk Quota” on the Home Page. The Disk Quota is displayed automatically on the Home Page if mailbox size limit is enabled. For security reasons, a user can verify when his/her account was accessed (Last login time) and from which IP address(es) it has been accessed (Last login IP). This box also displays the values (Current Login IP and Current Login Time) for the current login session. This value represents the height of the banner frame. You will need to experiment with this to find which is best for you (your users). You might want to start with a value of 500 pixels. WebClient users can see important information such as messages from their Administrator, Last Login Time, and actual mailbox size on a customized login page. 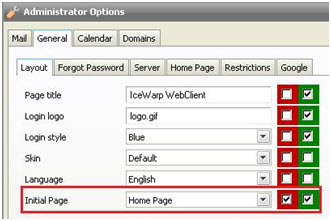 Home Page: Administrator can specify this page as the Initial Page which will be the first page that a user would see after logging in. If you’d like to experiment with customizing the WebClient Homepage, simply extract all the files from the attached zip fil archive to your \html folder.